Womens winter socks made of warm wool, cotton and polyester.The knitting techniques stitch these environmentally materials together,giving this sock a high-quality warmth,comfy and durable that will make your feet farewell to the cold winter. Elastic socks mouth，well-covered back heel and toe make this sock more skin-friendly that no pressure on your feet,You can dry it by hand or machine wash. Bring you a better comfort experience in cold winter. 5 pairs of socks with different vintage colors design are packed in a beautiful gift box. 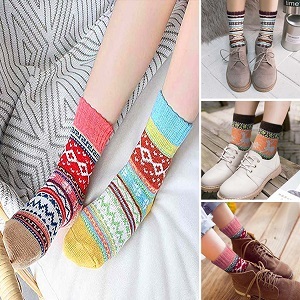 You can wear socks of different pattern socks every day in cold winter. 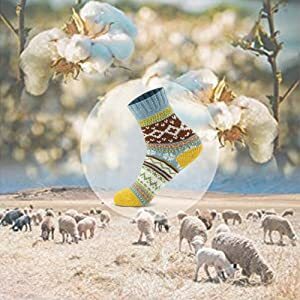 This breathable and moisture wicking thick wool sock is a good choice for you outdoors sports in the cold winter,warm and odor-fighting ,keep your feet dry after exercise. Wearing women cute thick socks, you can free mix your clothes and shoes at will in any occasion. 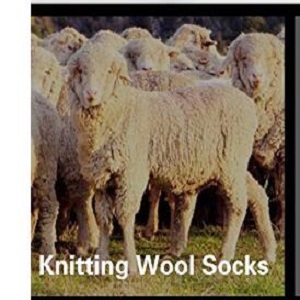 Even you can wear these wool socks on the floor at home all day . 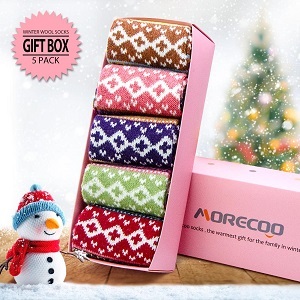 High-Quality wool socks with a beatiful gift box, 5 packs stylish patterns and mixed colors , what are you waiting for ? become Santa Claus to send warmth to anyone your love even yourself. Bought these for Christmas gift so I opened them to check quality. First they come neatly packed in a nice gift box. The socks are very pretty with nice designs. They are thick and long. Very pleased. Love these! They keep their shape while on my feet and after washing. I love these socks. I bought myself a pack and 2 to give as gifts. 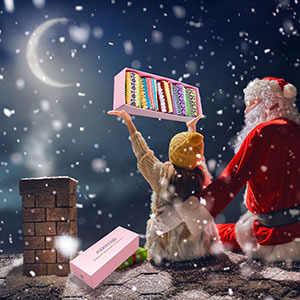 They arrive in perfect gift giving condition, well packaged in a pretty box. I wear a 6.5 or 7 shoe, and they fit my feet just right. For the price, they are 100% worth it. The colors are great and they match anything. Not really wool, but SUPER soft and quite warm. New favorites - and I’m picky about socks! Great winter socks, I can only wear them on truly cold days. Is this women sock packed in 5 gift boxes of different colors? The 5pairs of socks are delivered in one box. What is the size of thewomen winter socks? Women's sizes, approximately 5-9.but 10 maybe suit. Will this socks be deformed after washing? I bought it and it has been cleaned 2-3 times. They are still very good.